Health.Mil-The official website of the Military Health System and the Defense Health Agency. Experts across the Military Health System are collaborating with civilian researchers on an advanced alternative to socket-based prosthetics for some amputees. 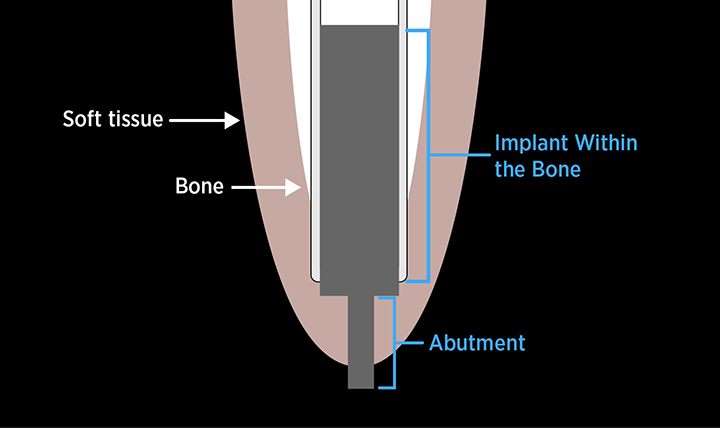 Osseointegration, a process that attaches the prosthesis directly to the skeleton, can improve comfort and mobility for qualified patients with amputations. Navy Cmdr. (Dr.) Jonathan A. Forsberg, an orthopedic oncologist at Walter Reed National Military Medical Center in Bethesda, Maryland, and an investigator at the Naval Medical Research Center, said he treats patients who are newly injured and those who have been living with amputations for many years. “Developing osseointegration as a capability within the Department of Defense makes good on our commitment to provide world-class solutions for combat casualties throughout the entire spectrum of care,” said Forsberg. Although clinical trials for osseointegration have been performed elsewhere around the world, the clinical trial at Walter Reed is the first of its kind to be performed in the United States. 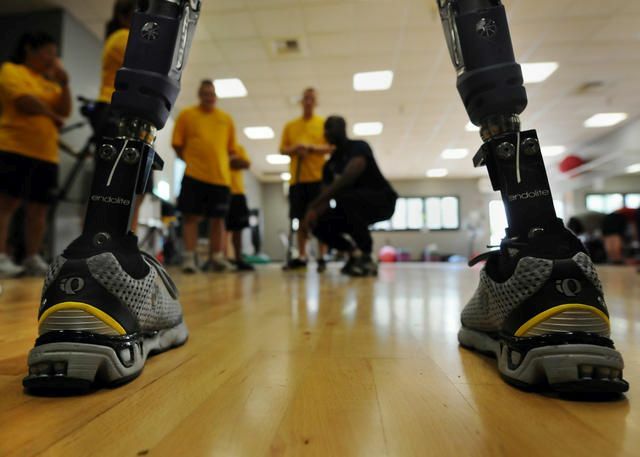 The Osseointegration Program within the Uniformed Services University of Health Sciences-Walter Reed Department of Surgery, is headed by Forsberg and Army Lt. Col. (Dr.) Benjamin Kyle Potter, chief of orthopedics at Walter Reed. They hope to improve function and quality of life while minimizing risk for these wounded warriors who have suffered visible and devastating injuries, said Potter. A four-year Food and Drug Administration clinical trial began in October using the Osseointegration Prosthesis for the Rehabilitation of Amputees (OPRA) – one of two implants currently available. At the moment, the study involves patients with transhumeral, or above elbow, amputations. However, Walter Reed is also looking at transfemoral, or above knee, amputees, said Potter. 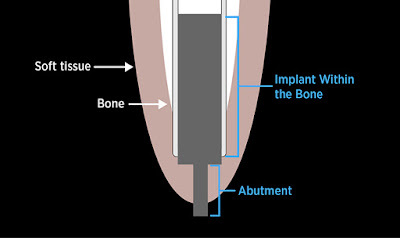 The initial surgery for osseointegration attaches a fixture or implant onto or within the bone, and the bone takes about three months to grow into the implant. The second surgery prepares the soft tissue for an attachment, called an abutment, which protrudes through the skin. Similar to the way a dental implant is secured to the jaw bone, a prosthetic limb is attached directly to the abutment. Over the next six months, the patient progressively transfers force to the skeleton in a controlled manner so that no loosening of any part occurs. Earlier this year, the program’s first patient, former Marine Sgt. Michael Frazier, received another type of osseointegrated implant from Potter and Forsberg: the DoD-funded Compress® Transdermal Implant. In May 2011, Frazier stepped on an improvised explosive device in Trek Nawa, Afghanistan, losing both legs to the blast. Many institutions are collaborating with Walter Reed’s osseointegration program, including the Office of Naval Research, Uniformed Services University of the Health Sciences, University of California - San Francisco, and several other universities. 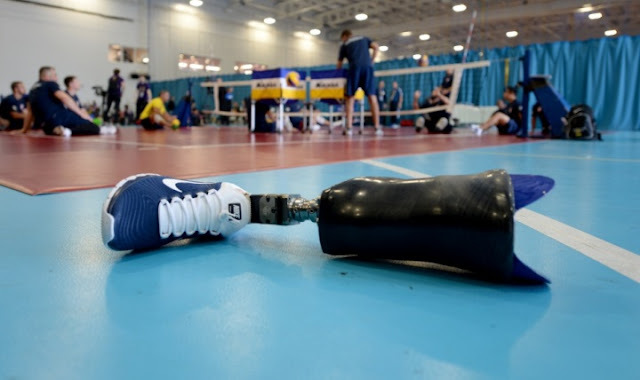 "By centralizing osseointegration at one DoD institution, which is at Walter Reed right now, we are able to standardize certain processes – patient selection, evaluation, surgery, rehabilitation – before pushing it out to the rest of the DoD community,” said Forsberg. 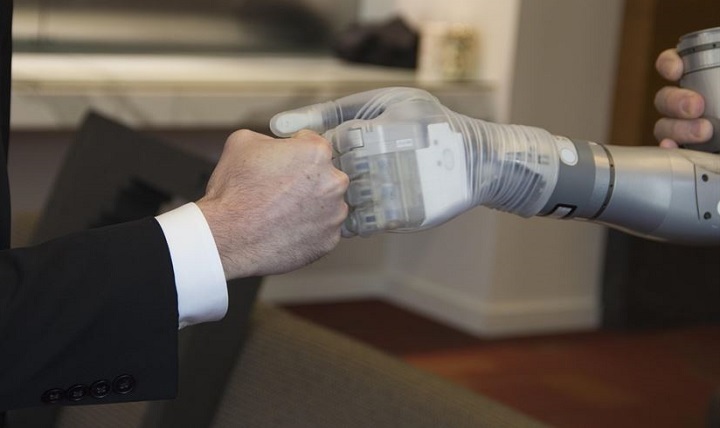 WASHINGTON — The Defense Advanced Research Projects Agency is making available to military amputees the first production versions of a groundbreaking upper-limb prosthesis, according to a DARPA press release. Dr. Justin Sanchez, director of DARPA’s Biological Technologies Office, delivered the first two advanced “LUKE” arms from a new production line during a ceremony yesterday – evidence that the fast-track DARPA research effort has completed its transition into a commercial enterprise, DARPA officials said. “Ultimately we envision these limbs providing even greater dexterity and highly refined sensory experiences by connecting them directly to users’ peripheral and central nervous systems,” Sanchez said. LUKE stands for “life under kinetic evolution” but is also a passing reference to the limb that Luke Skywalker wore in Star Wars: Episode V, The Empire Strikes Back. The limbs are being manufactured by Mobius Bionics LLC, of Manchester, New Hampshire, a company created to market the technology developed by DEKA Integrated Solutions Corp., also of Manchester, under DARPA’s Revolutionizing Prosthetics program. The prosthetic system allows very dexterous arm and hand movement with grip force feedback through a simple intuitive control system, DARPA says. The modular battery-powered limb is near-natural size and weight. 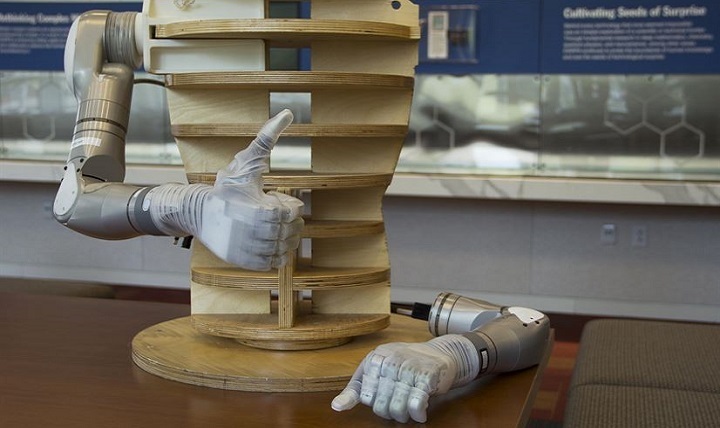 Its hand has six user-chosen grips and an arm that allows for simultaneous control of multiple joints using inputs that include wireless signals generated by innovative sensors worn on a user’s feet. The technology that powers prosthetic legs has advanced steadily over the past two decades but prosthetic arms and hands are a tougher challenge, in part because of the need for greater degrees of dexterity, DARPA says. When the LUKE arm first went into development, people who had lost upper limbs had to use a relatively primitive split-hook device that hadn’t changed much since it was introduced in 1912. DARPA launched the Revolutionizing Prosthetics program with a goal of getting U.S. Food and Drug Administration approval for an advanced electromechanical prosthetic upper limb with near-natural control that enhances independence and improves quality of life for amputees. LUKE received FDA approval less than eight years after the effort began, DARPA says.